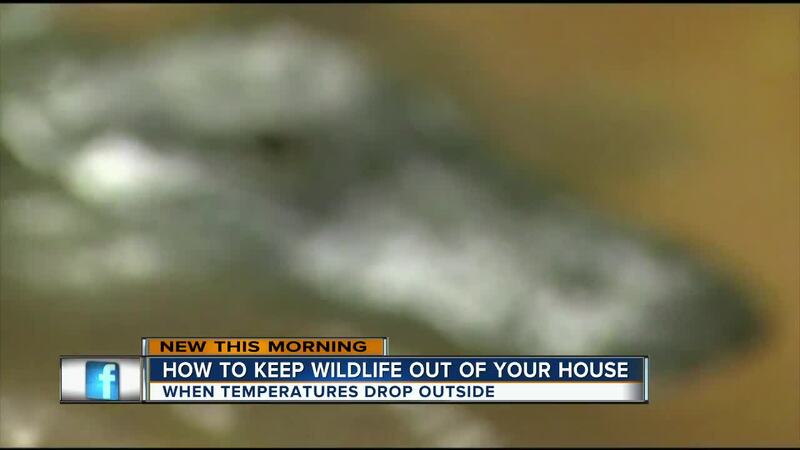 LEE COUNTY, Fla. -- We know when temperatures drop, uninvited furry guests try to come inside our homes to warm up. So what should you do to keep them out? Experts said the first thing to do is take a walk around your house and look for any cracks or holes in your doors, walls and windows. However, if you have one in your wall, do not patch it up right away. Experts say put some plastic bags or newspaper in the hole first, then check it after a few days. If the stuff gets moved, you may have something sneaking in and out of your home. You don’t want to accidentally patch up a hole with an animal inside, so call an expert to remove it before doing any repairs. On most occasions, animals hiding in your attic include snakes, raccoons, squirrels, iguanas and rats. When it gets colder outside, it gives these animals more reason to call your home their own. If you hear or see any wildlife animals in your house, call an expert to get it out. It doesn’t seem possible but a full grown raccoon can fit in a 4-inch round hole so Bruha said it’s best to get repairs done sooner than later.